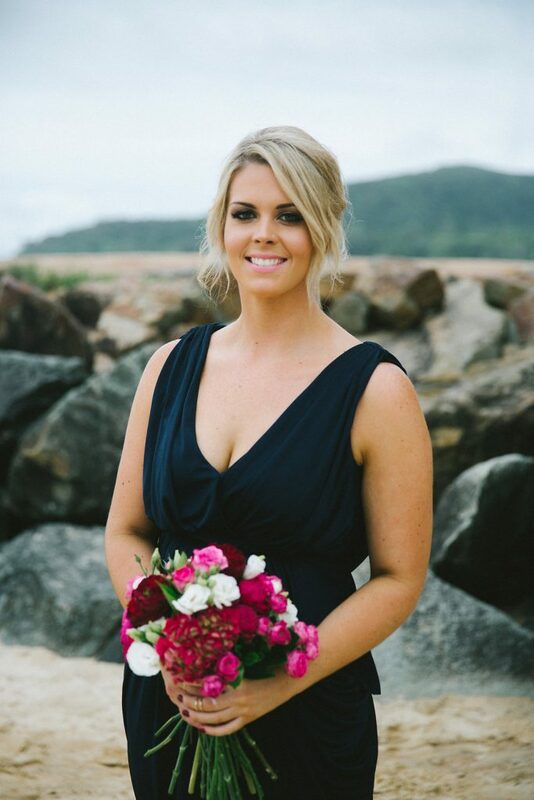 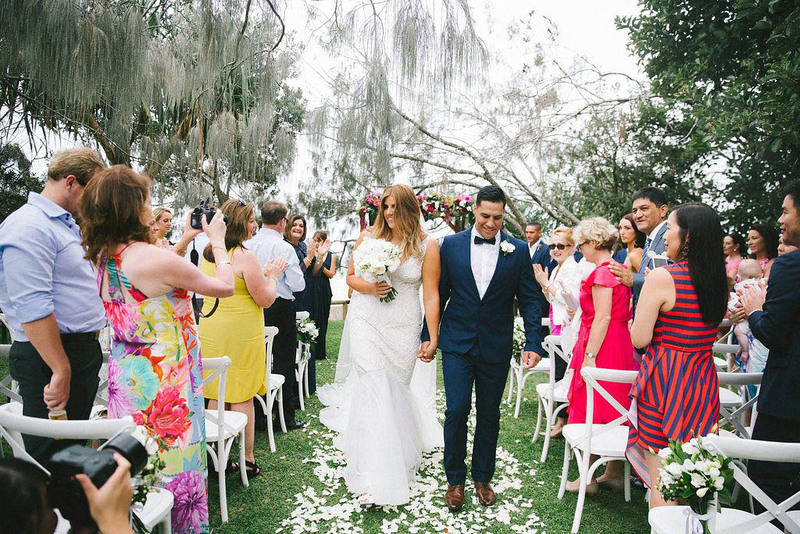 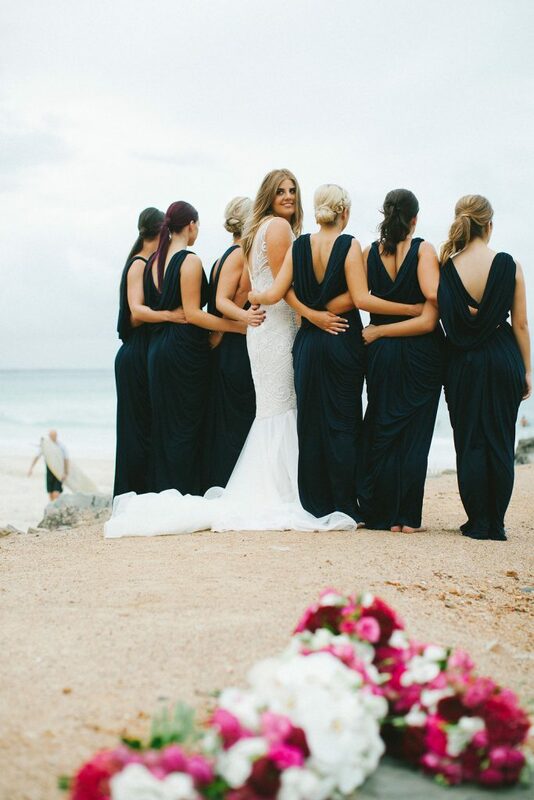 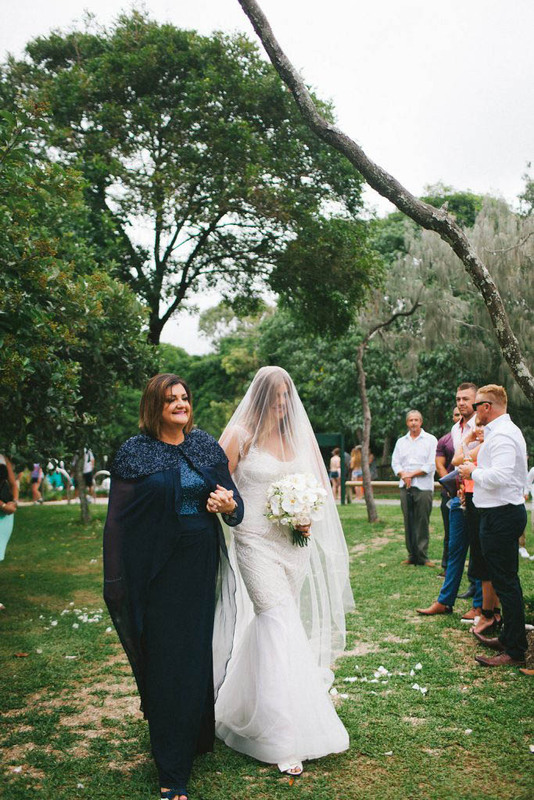 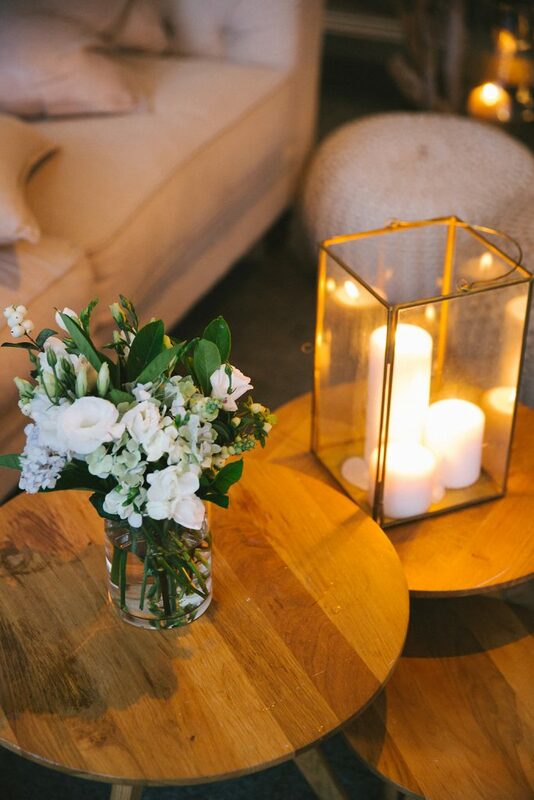 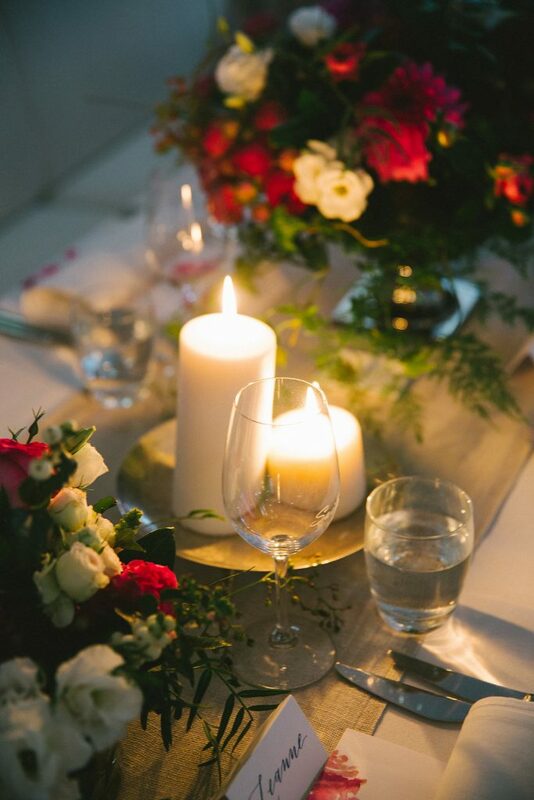 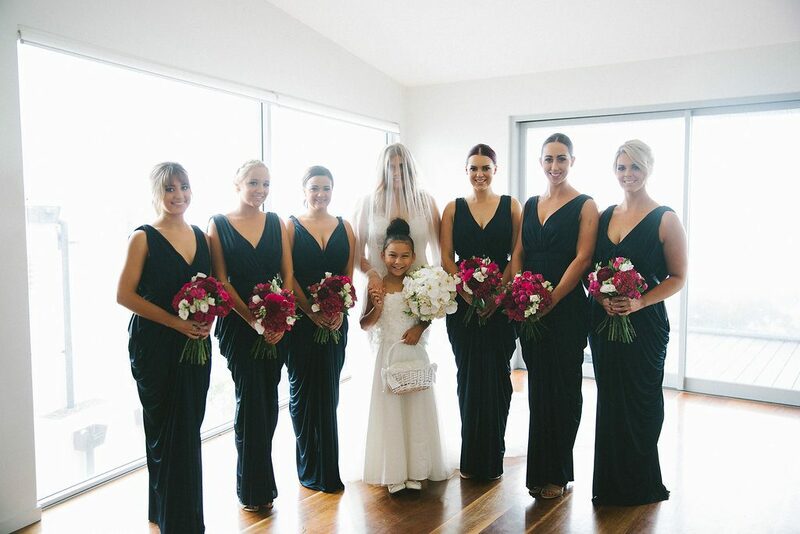 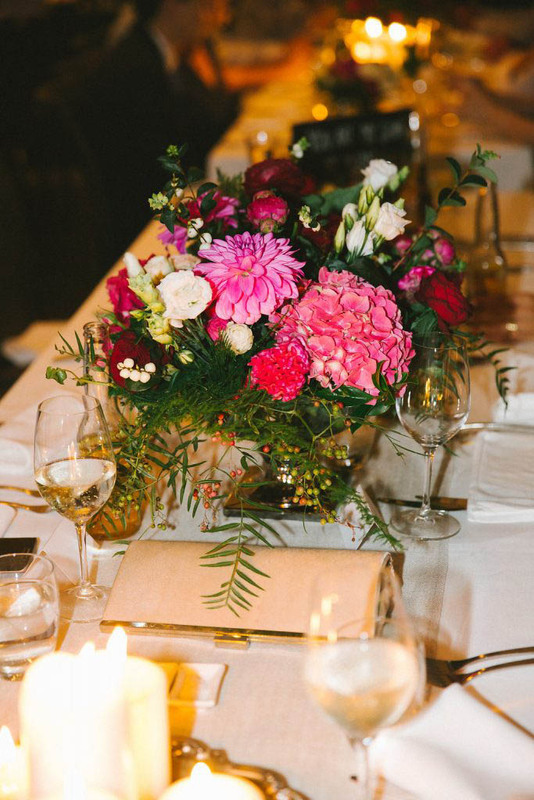 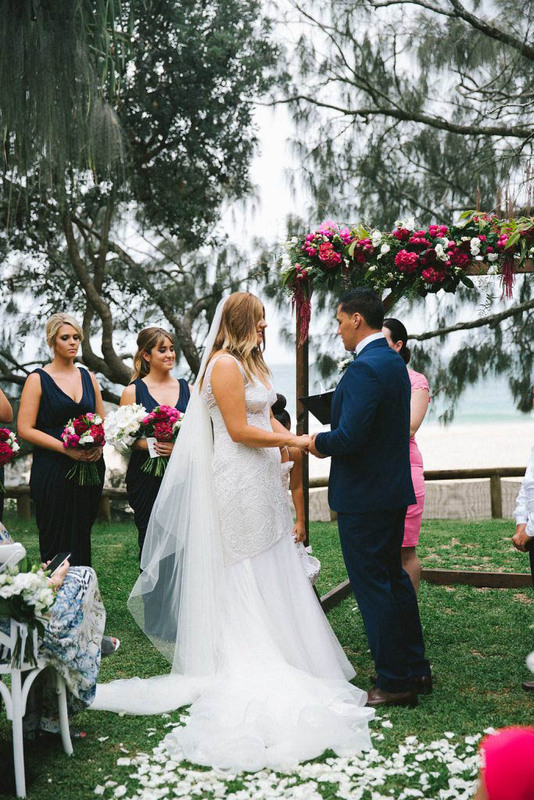 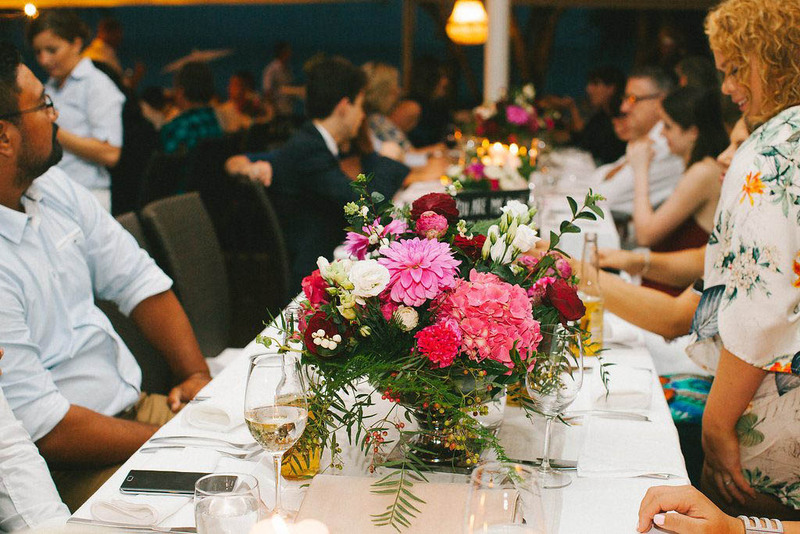 Noosa weddings ooze style and sophistication and this gorgeous soiree was no different. 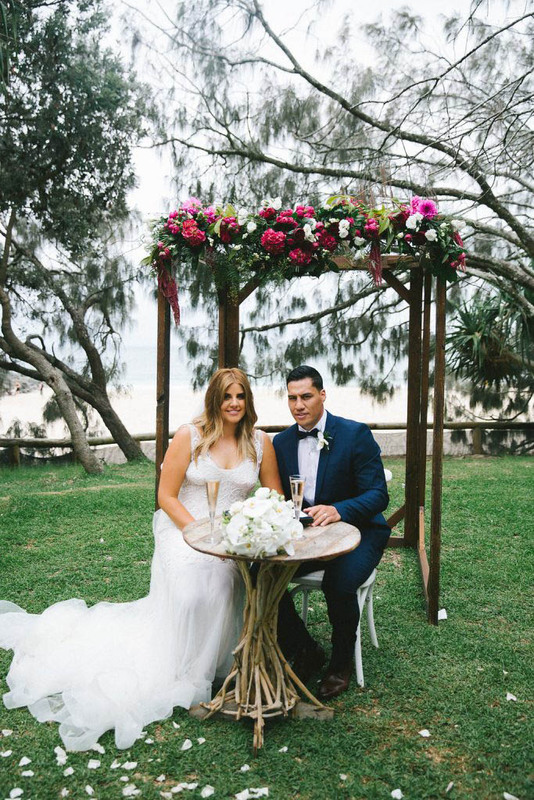 Laura and Brad’s divine modern Noosa wedding style featured a gorgeous summer inspired rich colour palette that featured ruby reds, crimson, magenta and fuchsia tones and included David Austin roses, hydrangea, lisianthus, dahlias and cottage roses, and of course those divine Phalaenopsis orchids. 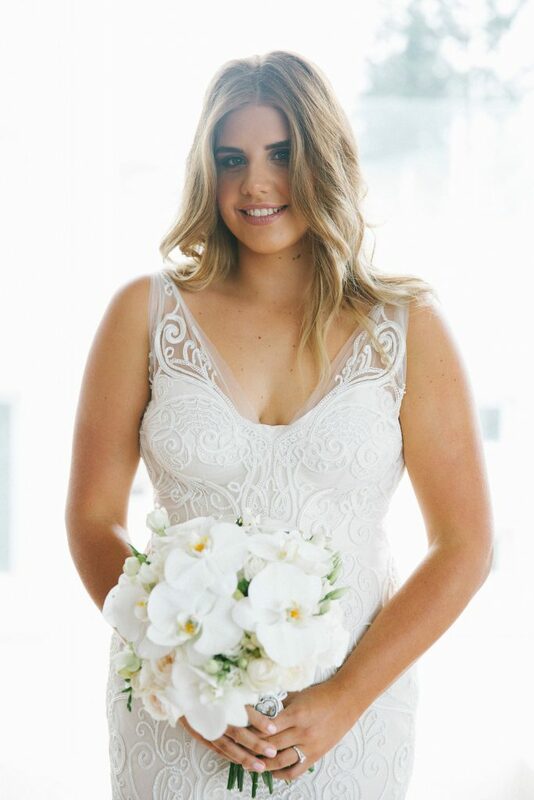 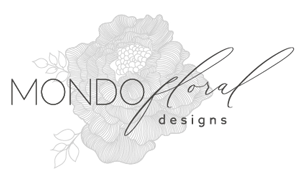 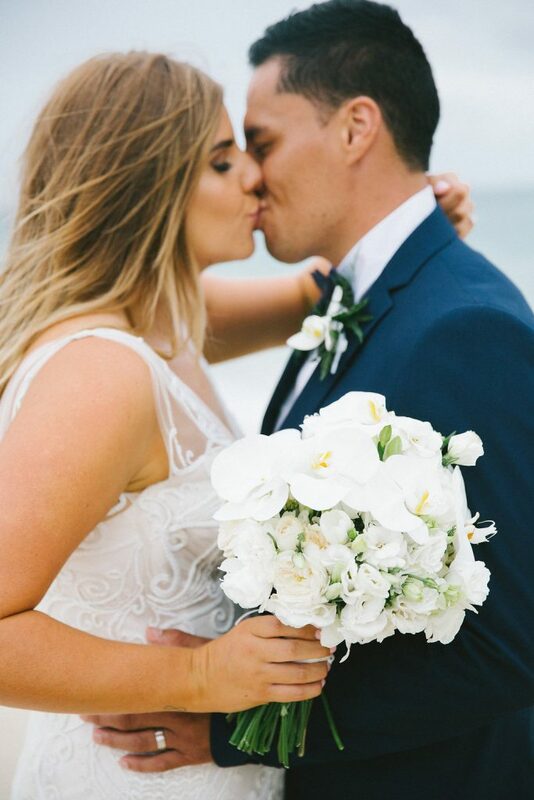 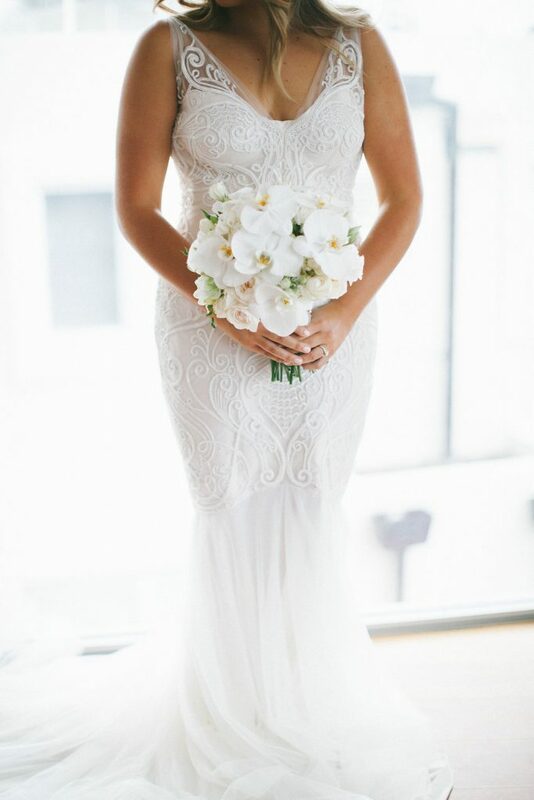 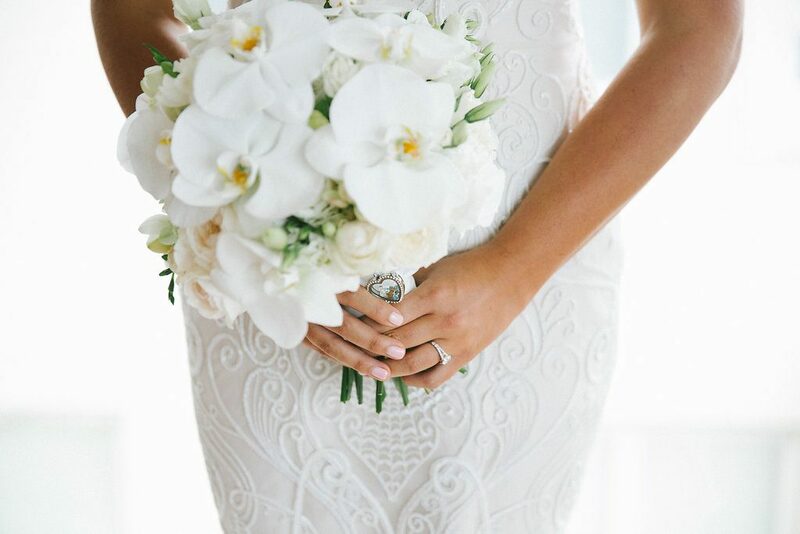 Laura chose to carry an all white bouquet that was modern and elegant and featured white phalaenopsis orchids, David Austin roses, lisianthus and freesias, this chic style of the bouquet design blended perfectly with Laura’s stunning modern gown. 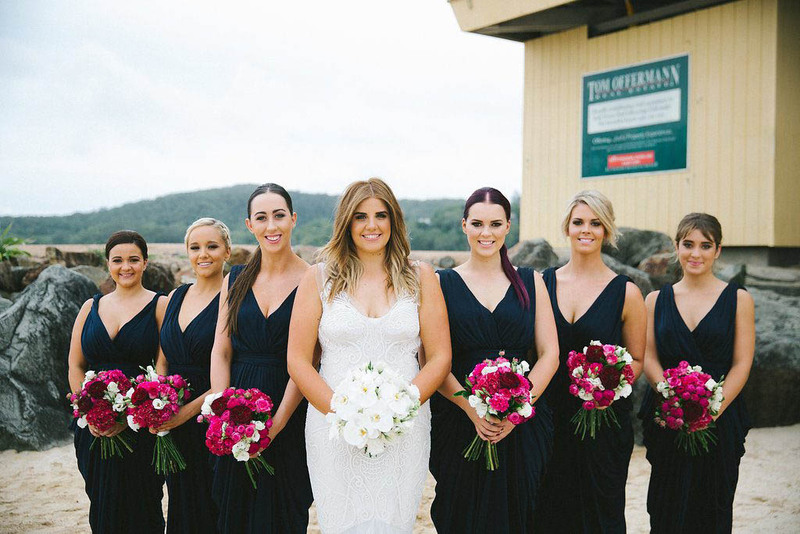 Six bridesmaids carried hand held bouquet designs featuring pops of vivid colour. 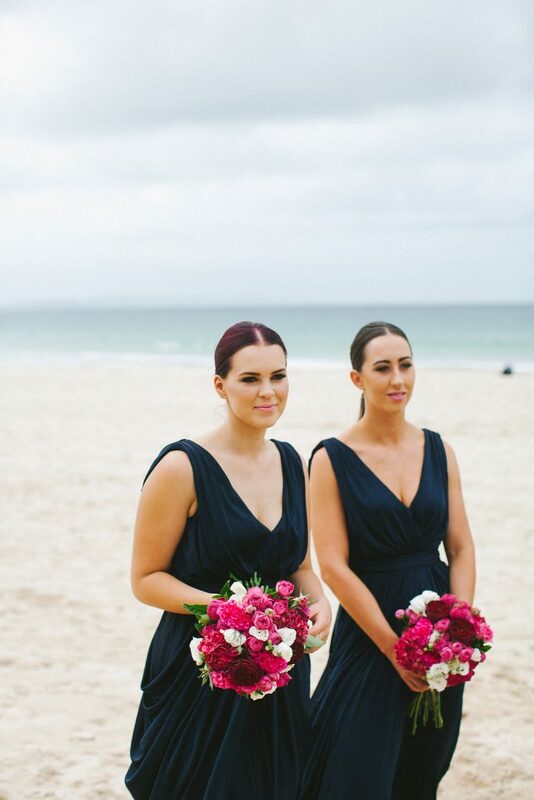 Ruby and magenta tones with the smallest pop of white featured in the beautiful bouquet designs. 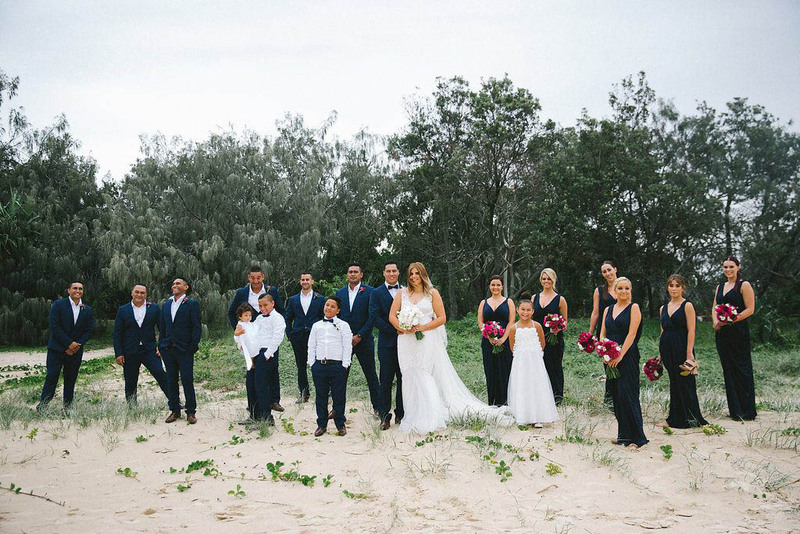 The boys navy suits featured magenta buttonhole designs and the bridal party was accessorised beautifully with deep navy and rich ruby and magenta tones. 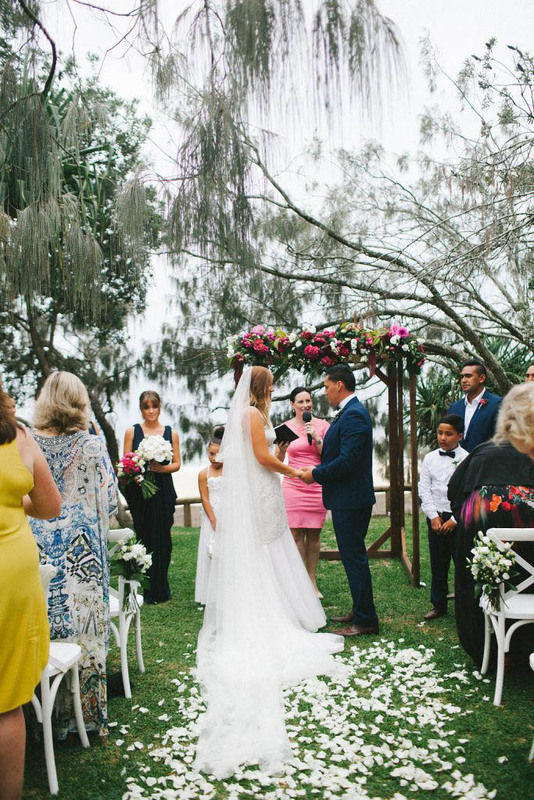 Laura and Brad were married at beautiful Hidden Grove, and with the Lovebird Weddings team we stamped this beautiful beachfront space with a dash of chic coastal style. 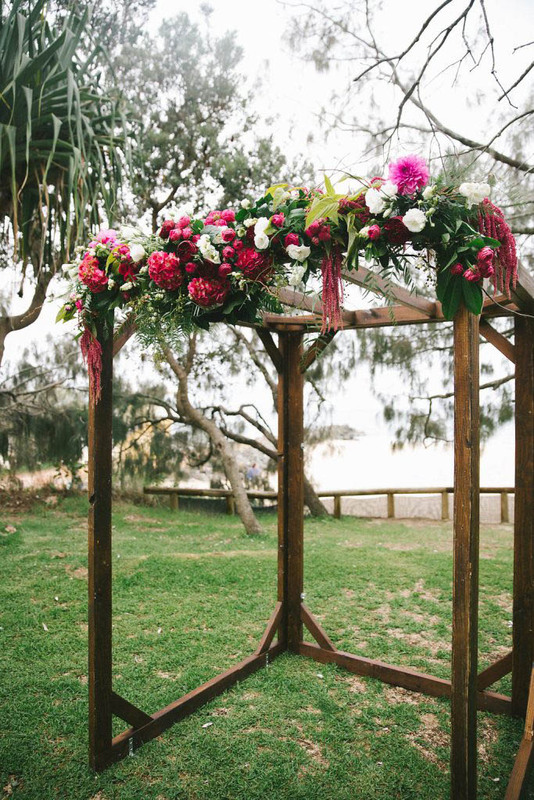 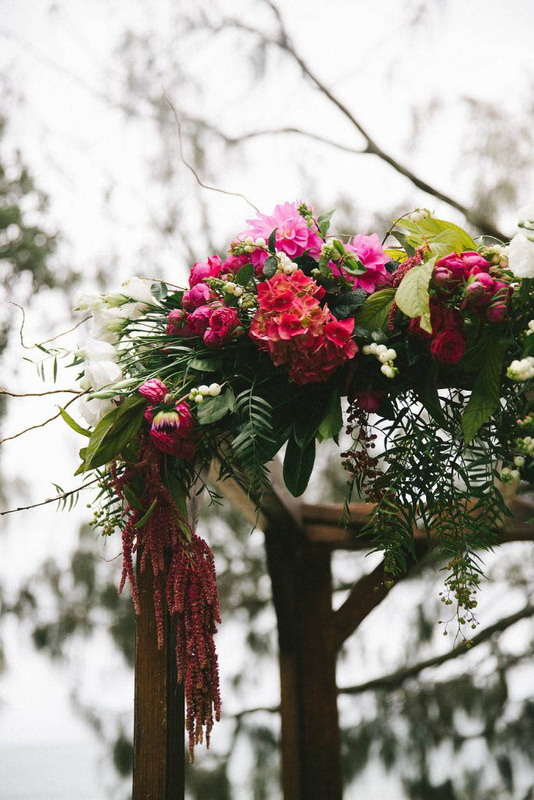 The rustic timber canopy was the perfect frame enabling us to create our stunning floral arbor feature. 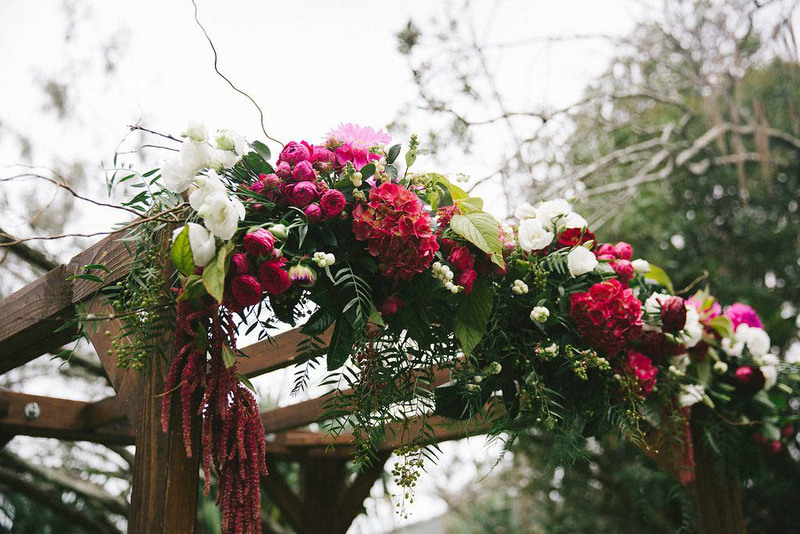 Hanging andromeda, hydrangea, cluster roses, lisianthus and dahlias featured, with lush green gardenesque foliage s and flowering fillers. 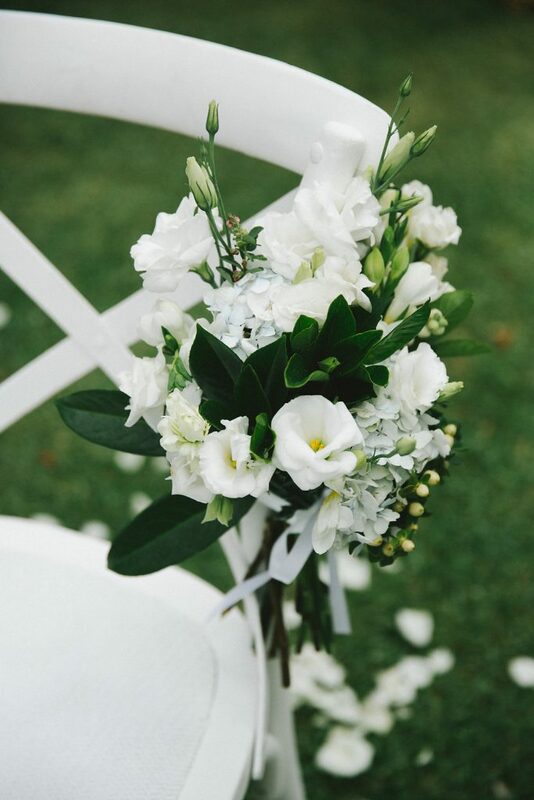 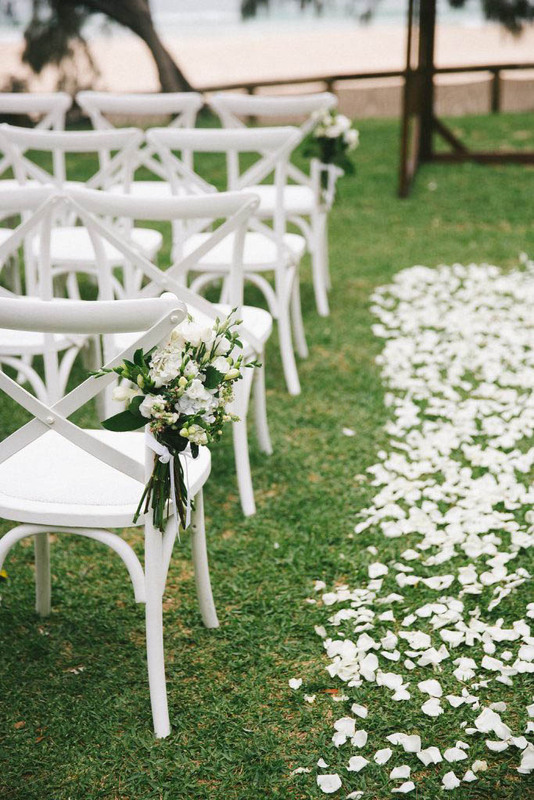 Sweet chair posies of white on white seasonal blooms were placed on each white East Hampton aisle chair, and a trail of beautiful white petals featured and marked the trail for our gorgeous bride and her lovely mother as they journeyed to the groom. 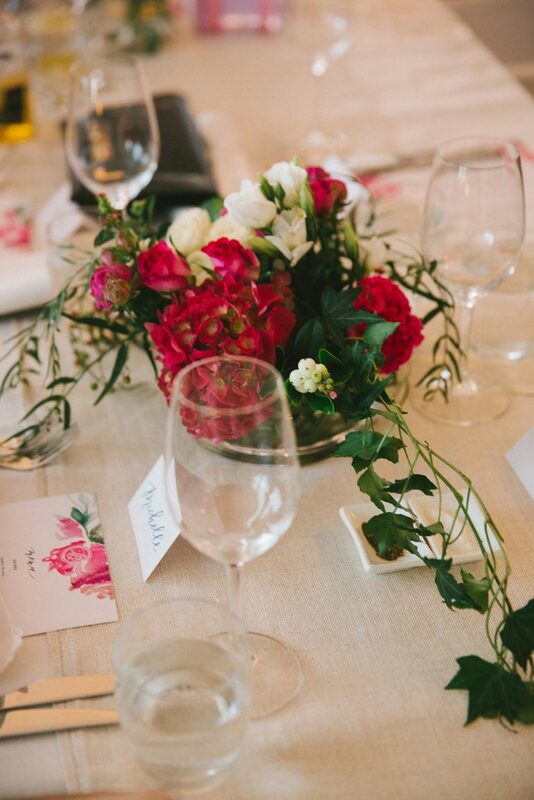 Sails restaurant hosted the celebrations for Laura and Brad and their families and friends, and we loved creating the glass bowl designs that featured on each of the tables. 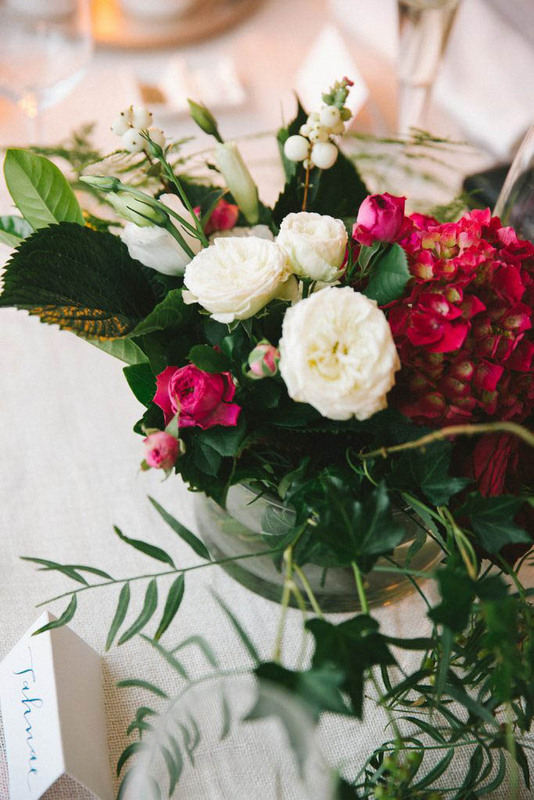 Our silver footed chalice vases and round glass dish vases featured with crimson, ruby and magenta blooms. 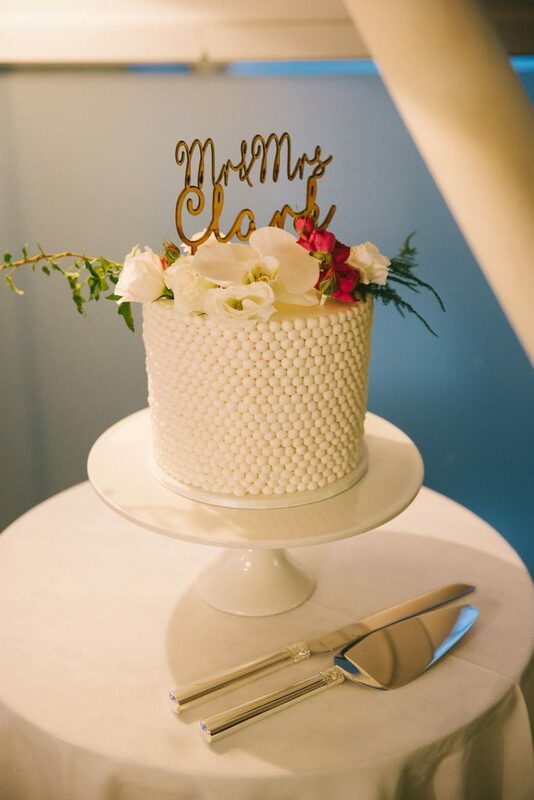 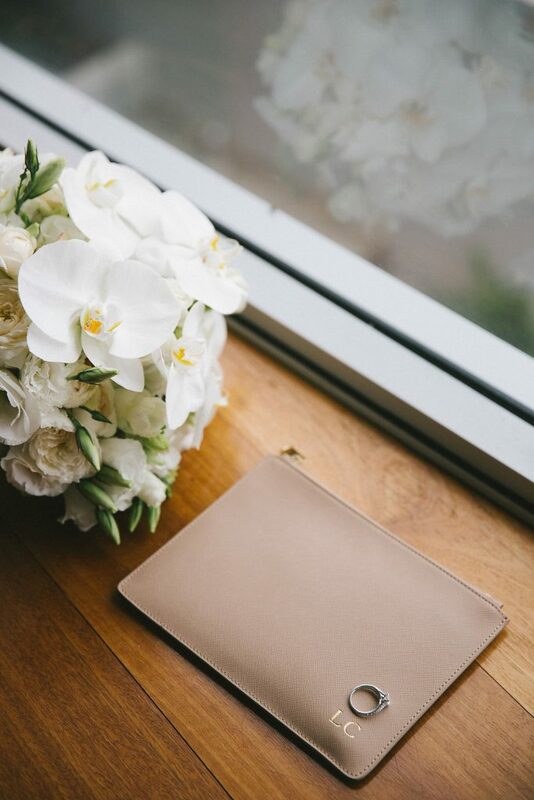 Beautiful images by Kait Photography with Annie Grace Celebrant and Cake Designs. 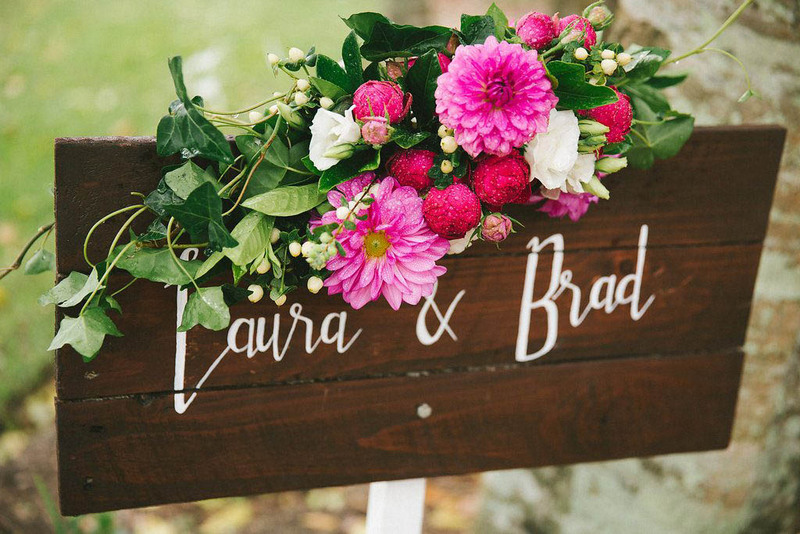 Congratulations Laura and Brad it was wonderful being a part of your day.